Most core training addresses the big ‘global movement’ muscles. While these muscles are important for any dancer, true core strength is more subtle and comes from much deeper within. This course addresses how to use true core control; how to train the right muscles and how to apply this to your dancing. This book is available both as a downloadable ebook or a hard copy manual. If you are looking for the hard copy edition of this book, you can find it now on Amazon! 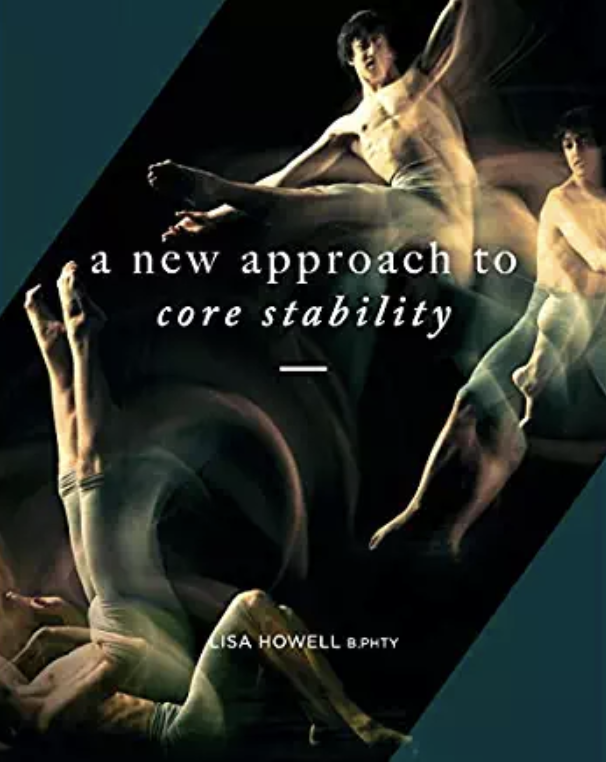 By far one of the major problem areas that we see as therapists working with dancers, athletes, office workers and weekend warriors alike is in the the area of “Core Stability.” The issues we see are two-fold. On one hand, very few people have good natural core control and dynamic stability of the spine. Lack of true stability of the spine leads to over compensation by other structures which leads to many of the injuries that we see in the clinic. This is especially true for young dancers who are training specific movements over and over again. On the other hand, many dancers, athletes and other individuals who have been involved in Personal Training, Physio or Pilates classes are performing “core” exercises that may focus too much on control or restricting movement by bracing. Often we discover that the very exercises that individuals are using to try and better themselves are actually part of the problem. Over recruitment of muscles can cause just as many, if not more issues, than weakness in muscles, and this often happens when individuals have been formally taught how to move. In addition, many people perform their stability exercises lying on their back, which does not prepare them for the demands of sitting, standing and dancing! 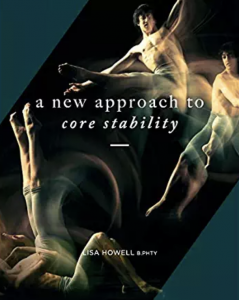 What is needed is a radical rethink of what ‘core stability’ actually is, and a new approach to training stability in dancers which is built up over the years. When addressing core stability when there is an issue with mobility or pain in older dancers, we need to make a careful assessment of each individuals movement strategies, isolate their specific weaknesses and a develop a carefully considered retraining program to retrain optimal stability. When we ask most dancers what they do for their ‘core training’ we get the common reply of “Planks, Sit-ups and Crunches”. These exercises are not necessarily “bad” exercises, however the problem is in the way they are performed if the individual lacks the control to do them properly. Also, if they are not movements that are a part of our normal movement in daily life, then excessive training of them can lead to altered movement patterns when it matters most! Training your stability should be done in accordance with what you actually have to do in life, whether that is sitting in an office, lifting a three year old, or performing a Grand pas de deux in a Classical Ballet. This program aims to give you a completely new approach to the development of core stability in your own body, whether you are young a dance student, a professional dancer, an office worker or a keen athlete. I aim to give you an insight into the nature of true core stability and how it can be developed naturally over the years, rather than with the onset of problems and pain. The most important factor in staying vibrant, vital, happy, healthy, and physically capable as we age is stability of our spine. If we are intrinsically more mobile, or spent many hours training in our youth; learning how to correctly stabilise our own spine can give us greater insight into how to train our students. As the demand on dancers increases through challenging choreography, acrobatics being included in dance, and ever increasing ranges of motion becoming ‘normal’, effective and specific training is becoming more and more essential into the long term health of our dancers. This program approaches Core Stability training in a completely new way. 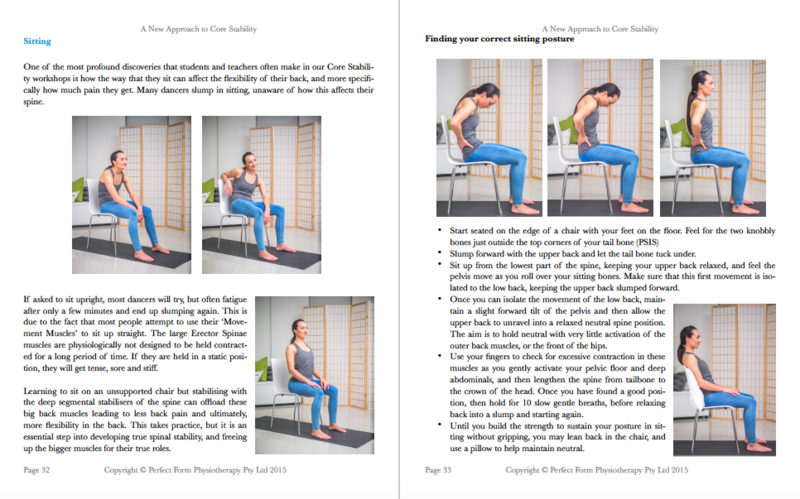 Using a simple visual chart comprising of 5 different positions (Lying, Side Lying, 4 Point, Sitting and Standing) and 5 different grades, you can work your way through the entire program at your own pace, layering levels of stability to achieve ultimate dynamic control of the spine and pelvis. We work on rediscovering the body’s own intelligence, and rebuilding the natural layers of stability that many of us fail to build as infants and young children. This logical and strategic process allows you to develop your own individual training program within the framework of a structured course, and will also give you unlimited options for variations, once you understand the principles. Thank you for taking the next step in your own professional and personal development, and I look forward to sharing the jewels that I have discovered in this area of training with you! I am copying a post I made at my West Shore Wellness Facebook page where I introduced my audience to “A New Approach To Core Stability”. On January 2, 2017 I purchased the New Approach To Core Stability book. 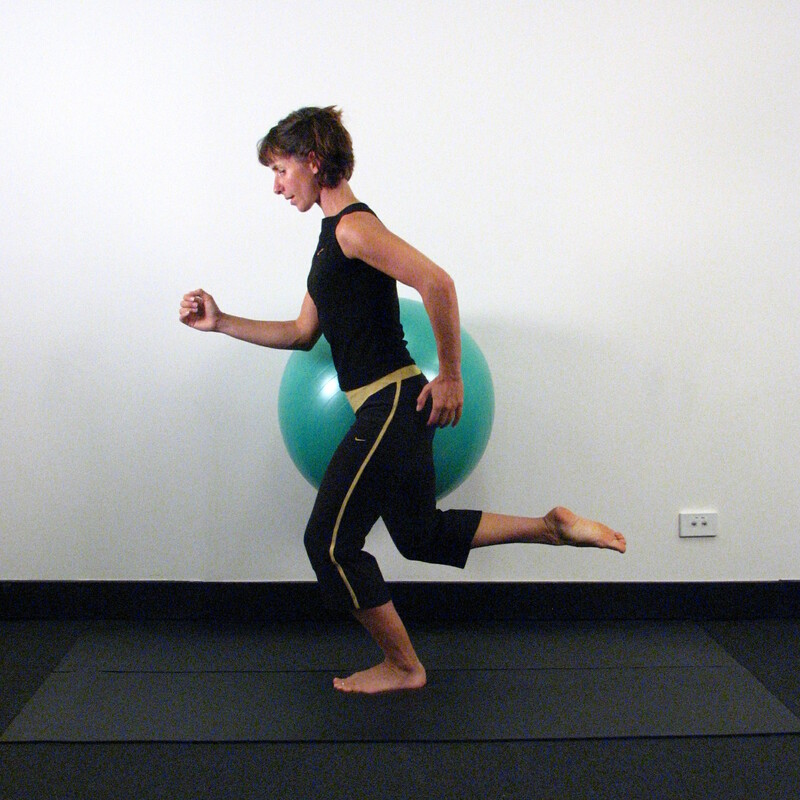 In it I found simple nuanced movements to achieve real core stability. I have suffered with low back problems for twenty years. The first step I took to overcoming this chronic issue was to commit to employing comprehensive medical nutrition. In March of 2013, this was a major, important, fundamental lifestyle decision. Partnering with two highly regarded naturopaths, who are experts leading the field in CMN, I shifted my paradigm. You can learn more about CMN with video posted in the West Shore Wellness timeline, or you are invited to get in touch with me for a frank discussion on this misunderstood, neglected and ridiculed piece of the pie of medicine. Living life without the chronic pain and immobility was an amazing achievement for me. I could now participate in activities that I had set aside due to the condition of my low back. As I have mentioned elsewhere on this page, movement, in my opinion, is an important component, tool, path to regaining, maintaining and advancing one’s physical, emotional, and conscious well being. In May of 2016, I took up the practice of yoga, at home, because of a new found respect in its centuries long practice for healing and strength in body-mind & spirit. I took to the mat each day. Each day brought more questions and realizations, surprises and progress. Since applying the techniques of New Approach, I am confident to say, I solved the back issue that presented itself in November of 2016. Accessing this information and putting the information into practice, I am experiencing another dimension of quality and refinement to my practice of responsibility for my health outcomes. This book challenges, with facts, the present thinking and teaching about core strength. True core strength has less to do wit six-pack abs and more to do with functional stability in movement, whether the movement is dance, sport, or everyday life activity. So happy to read this post. This is exactly the kind of feedback we love getting here at The Ballet Blog. It’s so great that we’ve been able to help you achieve a life without chronic pain. That kind of pain can be absolutely debilitating and living life without it must be so freeing. Please keep us posted with your progress! Lisa Howell knows it – the devil’s in the details! Thanks to her unique approach to core stability, my spine has finally come to life after decades of chronic stiffness and pain. The course is not about simply stretching the short, and strengthening the weak muscles. It is a much more subtle work of making all those tissues in our body play in harmony, at the right time and with the right intensity. I believe that only through such comprehensive and holistic approach our bodies can become finely tuned instruments in our everyday life, and particularly in highly demanding activities as is classical ballet. My problems with spine started when I was only 13 years old. The pain in my lumbar spine was at times so severe that I was on the verge of passing out. Looking at my X-rays scan, my orthopaedist said that my spine looks as if I was 60, and that one of my lumbar discs degenerated. Since than my problems never went away, but they also never stopped me from being physically active. In my mid twenties, I started taking ballet classes for adults. I struggled for years with slow progress and further injuries, not just of my spine, but also of my hips and ankles. I have almost given up. Fortunately, three years ago, already desperate, I came across Lisa Howell’s page, with all of her lovely courses. Now I’m 37, and thanks to Lisa, I still enjoy dancing, but I’m more strong, flexible, relaxed and secure than ever – my ankles are strong enough to do pointe work, my hips don’t hurt any more and I can finally do front splits! In addition to her other courses, which I also strongly recommend, A New Approach to Core Stability has made the biggest difference – in a very short time (I have noticed dramatic changes in just a couple of weeks!) it has changed the way I sit, walk, lift heavy objects (now I can lift them with flexed spine, no need for neutral position) and generally move, in everyday life and in a ballet class. I feel like because of our modern lifestyles we must consciously relearn how to optimally move our bodies, how to drive our amazing vehicles that the Nature has given us, and Lisa is giving us superb manuals to achieve that goal. WOW! That is absolutely incredible. The change in your life must be absolutely astronomical. So happy to hear that your pain has finally disappeared after so many years battling and dealing with that constant stiffness. It’s even better to hear that you are back dancing again and able to full enjoy it without pain restricting you. Keep going and keep training. 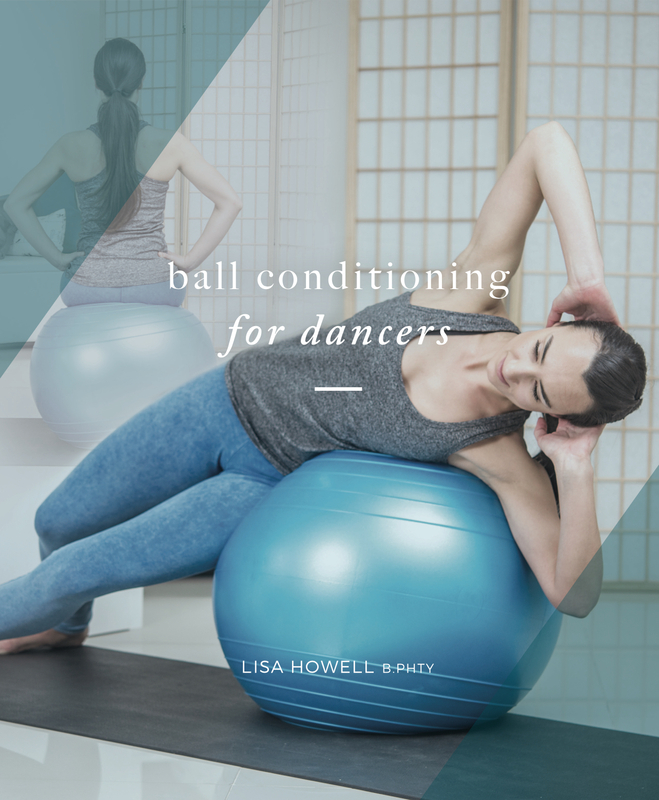 Ball Conditioning is wonderful for assisting in developing deep core strength, especially in dancers, however many people do not know how to use a ball properly. This two stage course starts with the basics of core control and progresses to advanced exercises in an easy to follow way. As you work your way through this 50 page program, you will build a comprehensive set of exercises to use within your current training, including how to put together a program. You will also learn everything you need to know about the principles of ball conditioning, myths about core stability, the anatomy of the spine, the importance of breathing and more. If you would prefer the full colour, professionally printed workbook instead of the Ebook, you can purchase this directly through amazon. This guide has detailed, illustrations of all of the exercises and helps you keep your notes and progress in one place. 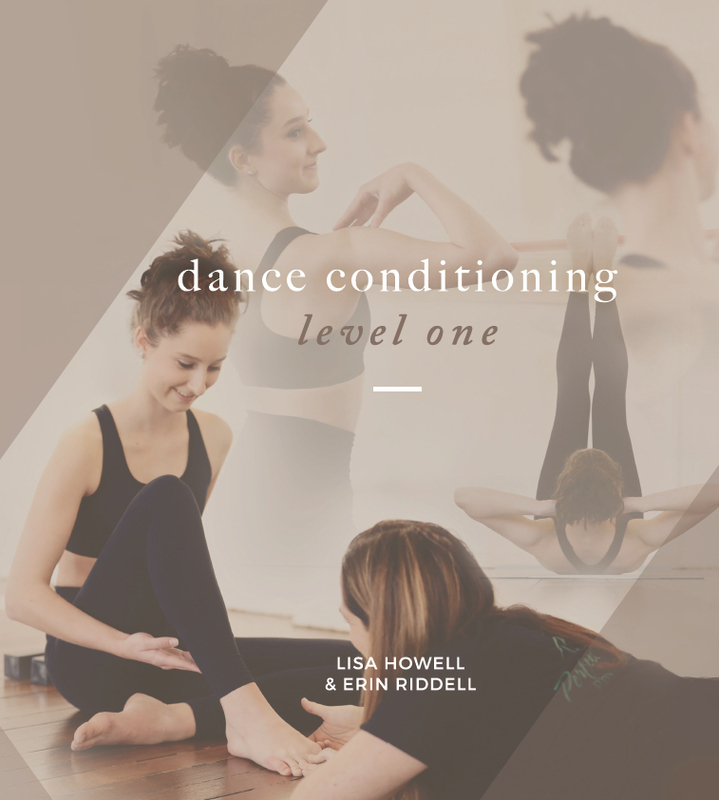 Our Dance conditioning program is a wonderful collection of more advanced exercises to take your training to the next level. This program expands on the underlying knowledge gained in ‘The Perfect Pointe Book’ and ‘Core Stability Course For Dancers’ to provide a comprehensive training program suited for high level dancers. 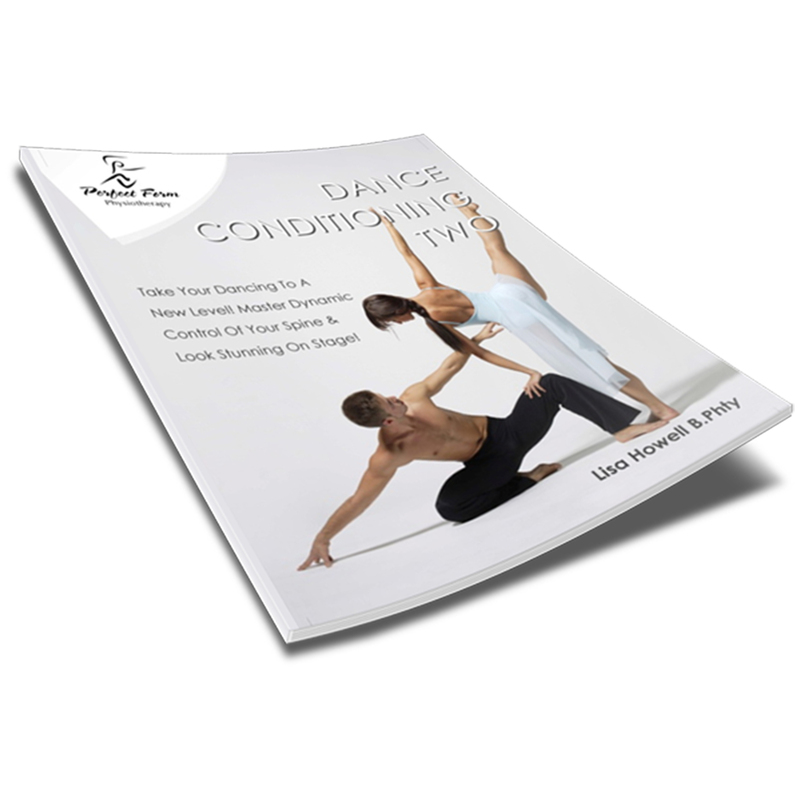 Our Dance Conditioning One program is a wonderful collection of exercises and releases for beginner and intermediate dance students, those under the age of 16 years or with less than four years training. This program includes a range of Pilates and Yoga based exercises specifically geared towards improving your core stability, turnout and some foot work. This product is now available in hardcopy edition from Amazon!